The Daily Pulse is a 9-step guide, daily rhythm and ritual, small steps towards life transformation, towards happiness. When your normal coping mechanisms and spiritual tools are not working for you and you need help looking past the dark to see the light; the Daily Pulse is the rhythm of doing something uplifting and positive for yourself every day. Starting and ending each day with deliberate choices creates rhythm in life and the Daily Pulse is an ritual that helps you to look past distress and confusion, to bring spiritual habits into everyday life and help you find peace and calm. The Daily Pulse reminds you that personal change happens in small steady steps each day. That the transformation of how you feel, happens in the gift of time spent alone, in the rhythm of an inner process. Joy of Morning Ritual guided meditations. A morning ritual is a profound and beautiful regular habit, that provides rhythm and peace to everyday. Starting each day with deliberate choices creates calm in life, helps you take small steps towards transformation, happiness and a refreshed awareness. In this practice, we are reminded that ritual is a precious ordinary experience that reawakens you to the beauty of a single moment and, that you are cherished and safe. Use this practice to see beyond the ache and disorientation of challenges in life and bring normalcy and rhythm to everyday. 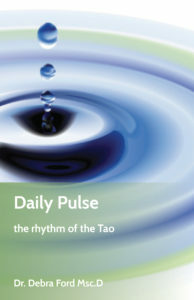 Daily Pulse, the rhythm of the Tao, by Dr. Debra Ford Msc.D.